A few weeks ago, Joseph Felcone emailed me to ask about helping with a mystery in the copyright records he’d been investigating, and asked if I’d help. For folks not in the know, Joe is an expert on New Jersey books and publishing, and the author of a number of wonderful books on the subject – including a recent catalog of all New Jersey copyright registrations from 1791-1870, which all fine libraries should own (if unsure if your library is truly fine, order a copy from Joe to cement such status). Joe was trying to determine information about A Member of Congress. A Novel. By William Wentworth (New York: G. W. Dillingham, 1898). He’d already figured out a fair bit of what I discuss below, but I think the process of figuring out the information is informative, because it tells us about how inaccuracy and uncertainty can creep into the copyright records. The story continues below. [Beckman, Edwin.] A member of congress. A novel. By William Wentworth [pseud.]. New York. (G. W. Dillingham co., 1898. 243pp. 12 . cop. (Dillingham’s metropolitan Library. no. 37.) (1898. no. 18639, Mar. 21., 2 copies rec’d Apr. 18. 1898.) Copyright by E. Beckman, Middleton. N.J.
(I fiddled with the colors a bit to make the fainter parts legible – the original is more yellow-white). 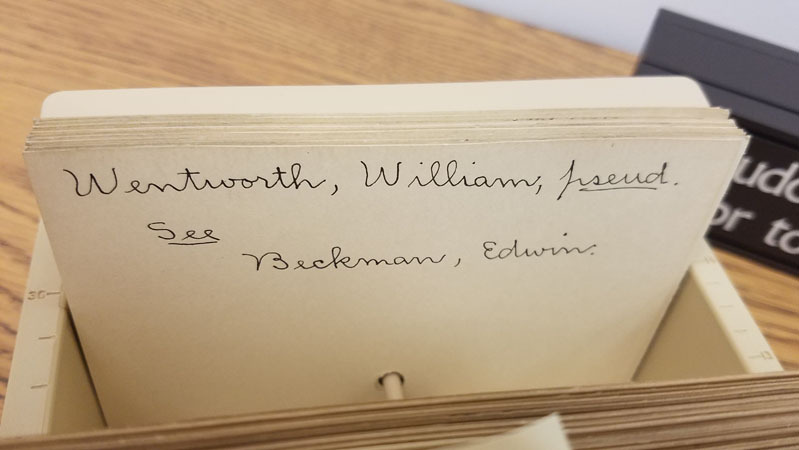 To be honest, that could say Beekman or Beckman. 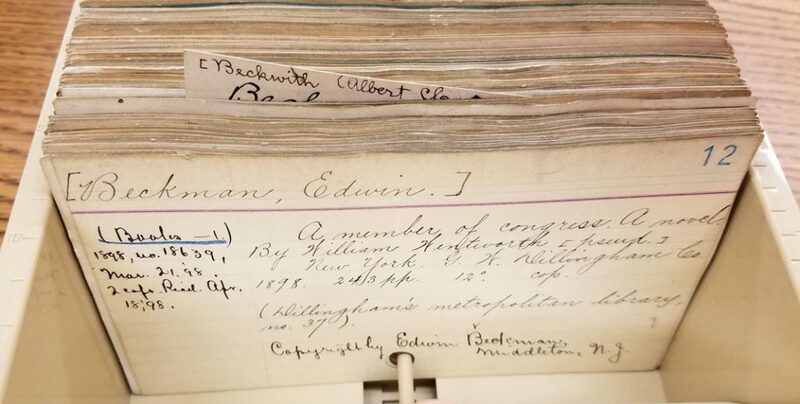 But knowing that there was an Edwin Beekman who could be the author living in the Middletown, and not an Edwin Beckman, it seems clear-cut to me that the attribution to Edwin Beckman was an error based on a misreading of the copyright registration. 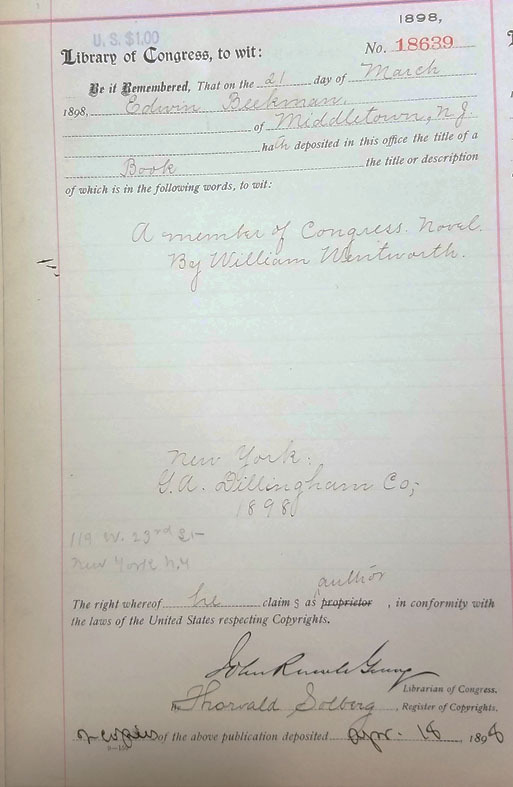 I don’t know how many other cases like this there are lurking in the copyright records, but it seems a worthwhile reminder of the fallacy of relying too heavily on records generations removed from the original. Thank you, Zvi. Having spent four decades doing this kind of bibliographical research, I can testify to the importance of going back to the source whenever possible and never assuming that a subsequent record, in any form, is accurate. Skepticism is often rewarded.